vehicle comes onto or drives off of this end of the bridge, there's a loud banging clatter. This din is repeated with the number of axles on each vehicle. The dump trucks (most of them pulling an extra dump trailer) and the big trucks carrying heavy mining equipment, and the many white pickup trucks of oil company employees, go overhead unseen, but not unheard! The wind dries my eyes and blows tar sands dust off the roadbed, an intermittent rain of gritty particles sprinkling onto my palette and sticking to the wet canvas. This makes the paint clumpy, the brushes clumsy, and fine smooth strokes impossible - but I've decided to just carry on, allowing the physical incorporation of the tar sands into my painting, persevering with this plein air work until the image resembles the scene. As I work, Fred is walking about 400 metres downstream, finding our first Athabascan mussels, Pyganodon grandis and Lampsilis radiata, associated with patches of black bitumen pebbles on the bed of the dry, gravelly side channel. He only finds dead shells and only in this one area, so we don't know where these mussels lived. Yesterday we came here to look for a potential painting site and I climbed up the steep grassy embankment from the clayey road that runs beneath the bridge to the shore where people drive down to fish. I climbed right up to the guard rail but even at that height the view downriver was partly obscured by Poplars. Fred joined me and we kept to the vegetated part of the embankment while clambering up and slipping down, rather than using the set of steel steps and landings with red warning tape across its bottom, or the loose gravelly dirt bike/quad track that looped up one side of the embankment, crossed beneath the bridge, and down the other side. At the top we stepped over two shiny silver-coloured pipes about 60 cm in diameter as they emerged at a low angle from the ground and then elbowed to rise as if helping to brace the bridge. They both disappeared into the structure of the span. At ground level we noticed damage to the thin outer skins of one of the pipes by ATV traffic. There were two creases and a slight crumple in one spot and a tear at a nearby joint. After a trip into Fort McMurray to use the Internet we returned to spend the night in a gravel pit near the bridge so that we could start this morning to paint and explore along the river shore. Overnight we gave a couple of young RCMP officers the opportunity to use their tarry terrorist line of questioning, including whether we were affiliated with Greenpeace. I said we were "independent" but didn't elaborate on the nature of our work beyond "painting the river". Morning light revealed that we had parked right over a "high pressure bitumen pipeline" according to a small sign on a steel post, and next to it was a similar sign that indicated the location of a "high pressure water pipeline". No wonder the police officers had been concerned! As I was making breakfast on the tailgate of the truck, I watched two men in hard hats climb the steel stairs to inspect the shiny pipes beneath the bridge. When they came down again I realized that I had not seen them step off the structure, and so I walked over to speak to them as they got into their trucks. I asked if they'd noticed the damage at ground level and they said they had not. The younger inspector grabbed his camera and up they went again, this time stepping off the platform and onto the embankment beneath the bridge. I returned to my own business, Fred returned for with a sample of snails, and after a while the inspectors came to thank us and to say that the damage had been reported and would be repaired, and ground level protection installed. "If a break happens here there'll be big trouble" they said, and thanked us again. They come here to inspect the pipes daily, but had never checked where they emerge from the ground! I then took the liberty of mentioning the loose joint on the roadbed of the bridge, just above the point where the pipes insert, and they agreed that this could be serious too - and then I rubbed in a little advice about the usefulness of public participation in pipeline safety. This 5 x 7 inch oil painting is available for $350 to support our independent survey of the Energy East Pipeline. While Aleta was getting ready to paint, I went off towards a logpile where I hoped I could find drifted land snail shells, along a muddy rutted track through Sandbar Willows, with its ruts full of water - then down a 2 m steep slope to a deeply rutted dispersal ground for beer containers, and across the dry side channel of the river where the density of beer containers thins out, but there's tape and video cassettes, some contributing streamers to the dry snags of the channel, and some made into a banner beside a tepee-like frame of sticks. This whole shore is deeply rutted by truck-size vehicles, including an heroic moist rutway that achieves 60 cm width before ending abruptly. We were told later that getting stuck in this way is regarded as a thrill, and that the unmarred ruts are achieved by winching the stuck vehicle out towards another truck. I went to the clayey downstream end of the logpile we could see from camp - - all uprooted, snapped or Castor-cut logs, no sawn ends noted - in a side channel of this wide boreal river, and found land shells present in the best handsfulls of drift from 1-2 m above current ground level, which, behind the pile, is 1.8 m above the bed of the dry side channel. There were little Liverworts in cracked mud in the lowest moistest area below the pile, where the cracks in the mud were 20 cm deep. The main width of the channels was as uniformly gravelly as a well kept driveway, with back concentrations of bitumen pebbles where their lower density had left them All of a sudden I saw a pair of Pyganodon grandis (Common Floater) shells in the middle of the channel. . . . where I'd been walking all morning. Having seen one, I found a scattering of shells of this species and Lampsilis radiata siliquoidea (Fat Mucket) in places where the bitumen pebbles seemed most concentrated, and then more shells partially buried in moist sand in a 30 m-wide band of fairly coarse sand just above the outlet to the side channel. I searched out to the main channel shore and back to the bridge and found no shells there - only piles of coarse brown-particle Branta canadensis (Canada Goose) droppings. There were 28 Pyganodon shells, small heavy greyish exteriorly worn shells with irregular lumpy beak sculpture, diversely compressed to cylindical in shape. There were only 5 Lampsilis, one large pair with smaller fresh shells. 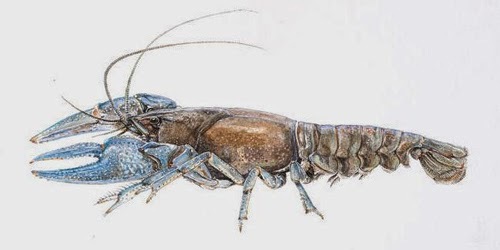 We'd known these species occurred in the Athabasca, but it's gratifying to find them, and interesting that their distribution is so, not unexpectedly, patchy in a low-temperature, high-energy river. that's "with black concentrations of bitumen pebbles"